Noisey is reporting that Vans Warped Tour will be coming to an end next year after one last cross-country tour, eliminating both the traveling punk-themed music festival itself and the Warped Tour’s use as a metric for just how out of touch a given person is with what “the kids” are listening to today. 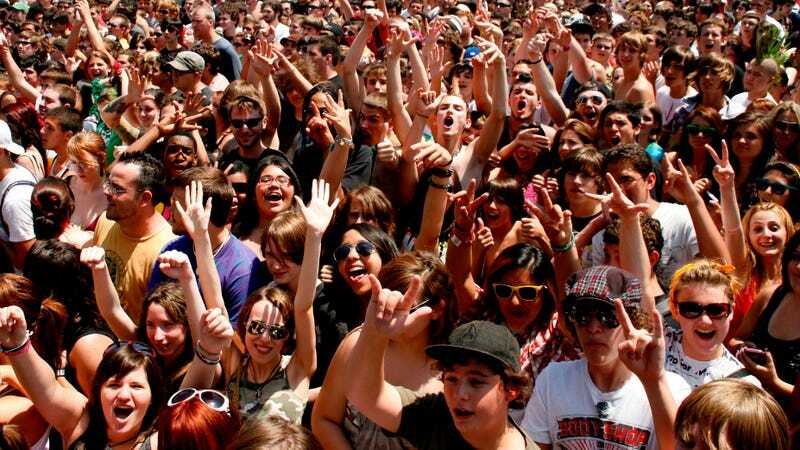 That means young people will no longer be able to spend a summer day in a mosh pit, listening to their favorite songs from Being As An Ocean, Doll Skin, Hands Like Houses, and Carousel Kings, while older people will no longer be able to peruse a list of bands like that and wonder if any of them are real. Warped Tour founder Kevin Lyman announced the news himself in a statement on the festival’s website, and though he doesn’t give a specific explanation for why the festival is ending, he does touch on a lot of the ways that the music world has changed since Warped Tour began in 1995—perhaps implying that things have now changed too much. Whatever the reason, he touches on a lot of the big acts that have gone through the Warped Tour over the years, including Blink-182, No Doubt, The Offspring, Rancid, Avenged Sevenfold, and Fall Out Boy, as well as Katy Perry and The Black Eyed Peas. I truly look forward to seeing as many of you as possible during this final cross country run, and getting to thank you for your support on this wild adventure. Until then, take care and be safe.